Businesses are often focused on offering the highest quality products and services, hoping to leverage that work into revenue and growth. So it can be frustrating when an issue outside of their control affects their business, especially when that issue is the presence of unwanted pests. Birds are one of the most challenging pests for local businesses and commercial properties in Vancouver. That is why Local Pest has partnered with so many commercial properties to make sure that birds are safely and delicately removed, and unlikely to hurt your company or your building. For more information, call us today at 778-828-6094. Transmittable Diseases – Birds, especially bird droppings, can carry transmittable diseases that may be a risk to those coming onto your property. This is especially problematic if you operate a food service, as the presence of birds increases the chance of food poisoning and other issues. Trash and Mess – Birds have a tendency to invade trash and make messes that make your storefront look messy and require extra costs for cleanup. Poor Customer Experience – Birds can hurt the customer experience. 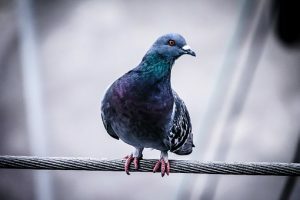 Bird droppings can cheapen a property, and bird noises or hassling from pigeons can all make a customer uncomfortable. Damage to Building – Birds and bird droppings may damage buildings, affecting paint, wood health, and more. All of those issues lead to substantial costs and frequent cleanup. Bird noise can also affect employee productivity, and should a bird get inside the property it can cause substantial challenges for everyone involved. Using spikes that make it difficult for a bird to land. Sealing off entrance points and modifying places that birds can nest. Safely trapping birds and moving them to a new location, and More. There are many techniques that are designed to address these issues depending on the type of bird and the specific property needs. But each one is proven to help deter birds from the property and keep them from coming back. When combined with regular, long term maintenance, you can be confident that your commercial property or business will be bird free. Humane bird control is the best way to address avian challenges. Let Local Pest help. Our experience with commercial pests has allowed us to become the industry leader in bird pest control services, and we’d love an opportunity to show you what we can do. Contact us today to learn more.